You know there are some trailers that you watch and they just move you to tears. You haven't seen the movie yet but you know it is going to be something big and something that touches your heart. That is exactly how it was for me when I saw Same Kind Of Different As Me. Renée Zellweger shines on the screen. I can't wait to go see this one on October 20th! I feel like this movie has a great potential to motivate hearts to action. I pray it does. We need more healing and love in this world. What are your thoughts? 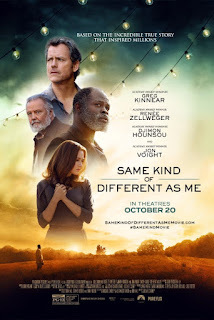 One lucky reader will win 2 Tickets (Fandango Codes) to see Same Kind of Different as Me! It looks very inspiring. I will be looking forward to watching it!! If the movie trailer is anything to go by I'm going to need a whole box of tissues when I see it. This type of film just tugs at the heartstrings in a good way and it features very good actors. Looking forward to watching this movie when it comes out. It looks like a good movie to watch with my family.